Lines - its 20th Fun Ship - in the tradi- tional handover ceremonies in Helsinki. For anyone who has ever had the priv- ilege to attend such a delivery, seeing a new cruise ship rolled out in the middle of the Finnish winter is truly an awe- inspiring, if not one of the most ironic, sights. However, it is a testament to accrued cruise industry expertise and a stable infrastructure of equipment and system suppliers that keeps the shipyard at the forefront. February 27, 2004, by former Army pri- vate Jessica Lynch, after which is was schedule to depart on its inaugural three- day voyage from Jacksonville. 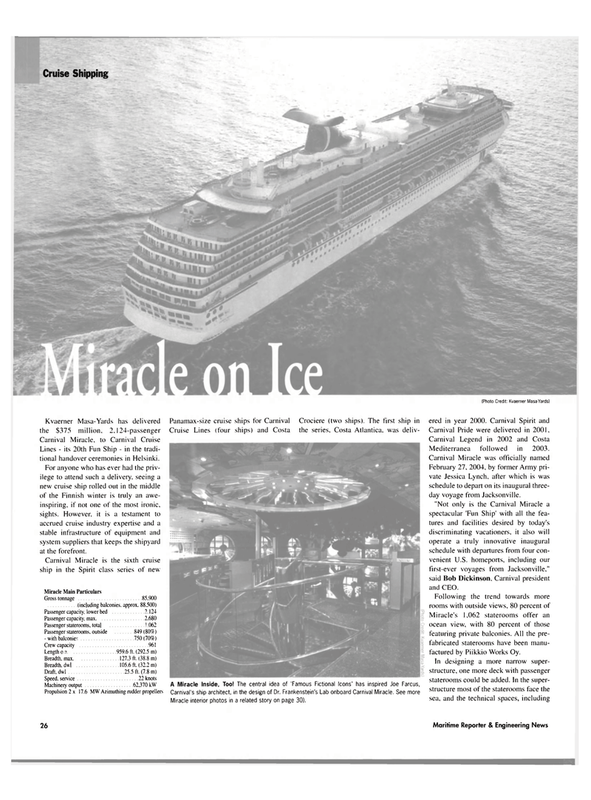 "Not only is the Carnival Miracle a spectacular 'Fun Ship' with all the fea- tures and facilities desired by today's discriminating vacationers, it also will operate a truly innovative inaugural schedule with departures from four con- venient U.S. homeports, including our first-ever voyages from Jacksonville," said Bob Dickinson. Carnival president and CEO. Miracle's 1,062 staterooms offer an ocean view, with 80 percent of those featuring private balconies. All the pre- fabricated staterooms have been manu- factured by Piikkio Works Oy.